In its clear form, a single layer of ETFE foil can transmit up to 85% of the light which hits its surface. 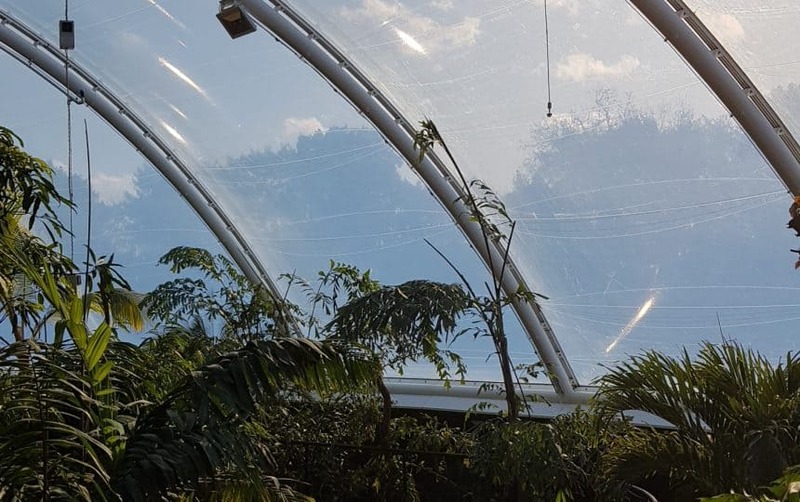 Whilst desirable for some applications, high levels of light transmission can cause glare and, when combined with the insulation given by a multi-layer cushion, can mean the space will overheat due to the greenhouse effect. 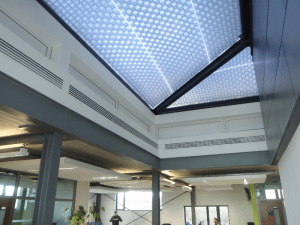 As a result, we often look to reduce the level of light (and in turn heat) coming into a building in order to make it a more comfortable space. Fritting (or printing) is the most commonly used way to do this; a regular pattern of shapes is printed onto the underside of the top layer of ETFE foil. 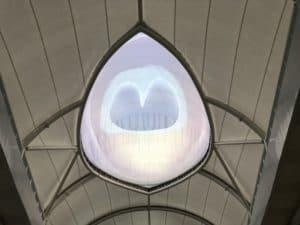 By using a silver ink, the pattern reflects light, and therefore heat, before it permeates through the ETFE cushion roof and into the space below. The different densities of ink and our wide range of fritting patterns means we can tailor the level of light to any specific project, reducing light levels from 85% down to 20% and everything in between. The choice of pattern and ink is usually determined in conjunction with the project design team, often working to meet both light transmission and G-value/solar heat gain coefficient targets. So what will fritted ETFE look like once installed? This will vary depending on the pattern but many are designed to be unreadable if stood a few meters away. Alternatively you can choose a pattern which makes a visual statement as well as offering solar control. Fritting is not always used to control light transmission however, sometimes it’s chosen purely for the visual impact it provides. Whether bold shapes such as the leaves used at Trinity Walk, Wakefield, the full colour peacock feather image covering the ETFE cushions at Kertajati Airport or the coloured dots used at the Serpentine Arthouse Pavilion, fritting can create a unique aesthetic. The level and density of fritting is usually determined at design stage and gives a fixed level of light transmission at all times. However it is possible to have a more tailored system. Intelligent printing of ETFE cushions combines the technology of fritting and the ‘live’ nature of an ETFE cushion system to offer maximum flexibility. Intelligent printing is used with a three layer ETFE cushion system and both the top and middle layers are printed with an offset pattern (usually squares). By altering the air pressure in the individual chambers within the cushion, layers are brought close together providing maximum fritted coverage or separated to maximise natural light transmission. The movement of the layers can be either manual or automated by the addition of light sensors installed on the roof of the building. Sensors allow the end user to set light levels that are maintained by our air handling unit and automatically adjusted. As the position of the sun moves through the seasons, an intelligent printing ETFE system can react and respond. Take a look at the ETFE cushion roofs at Lancaster University and Bart’s Hospital for examples of this technology in use. Want to know more about other ways to control solar gain? Check out our article on IR Cut ETFE foil.